Dapper is a great — and much, much too underused — word in the English lexicon. It conjures images of men in coat and tails, resplendent with top hats and monocles. A sweet dame on their arms, they head out to a night at the theater, or even better — fisticuffs. Dapper, to me, means the peak of refinement. A man or woman so impeccably dressed and cultured that even the lowest of rapscallions would be unable to question their pure sophistication. 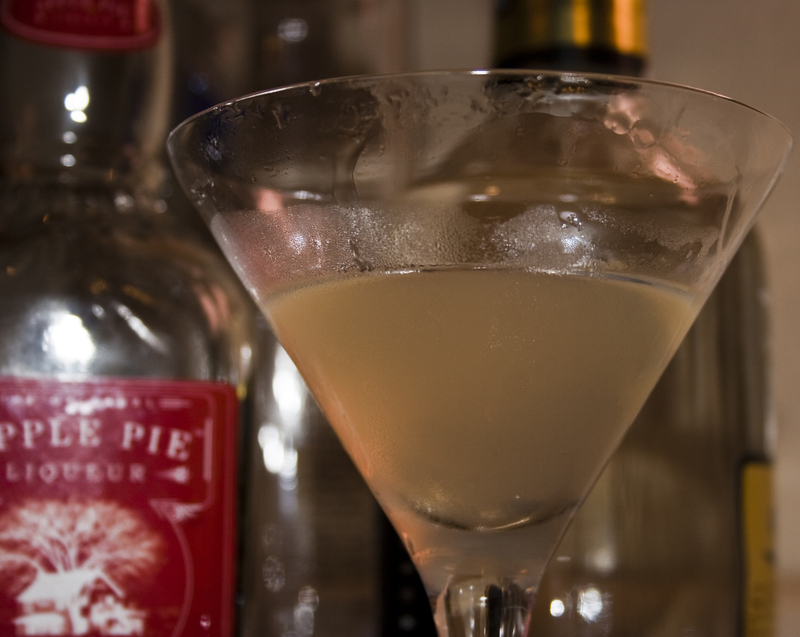 Which is why I was attracted to tonight’s drink, a martini that calls itself the Dapper Apple. Hold onto your monocles, lest they fall into your drink in shock. Behold the recipe! Pour ingredients into a mixing glass and stir together. (To answer those that have asked me. Mixology is great because while the specific tools are great, you can improvise. For example, I’ve been known to substitute a beer pint glass for a mixing glass and a chop stick for a stirring stick). Clean. Cool. Sophisticated. Dare I say… dapper? It’s excellent. It gives a nice cool, autumnal flavor. The sweetness of the apple liqueur, mixed with the acidic citrus of the triple sec and lime juice compliment each other very very well. I could easily foresee hanging out on my front porch with a football game on the radio, enjoying this. Of course, a smooth vodka does wonders to bolster the body of the drink for that nice mix of warm and cool as you sip it. This would be a great Thanksgiving pre-dinner drink. This one will most certainly make it into our regular rotation. Even Jenn likes it! And unlike most martinis, that become much more harsh as they head towards room temperature, this one keeps its kick without becoming ungodly harsh. A foofy martini, to be sure. But a delicious one nonetheless. My friend Eric from Lawrence would be proud.